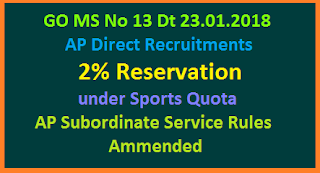 In the G.O 2nd read above, orders were issued declaring sport policy by extending two percent (2%) sports reservation in future direct recruitment at all levels in Government of Andhra Pradesh. In the G.O.3rd read above certain guidelines were issued governing such appointments. 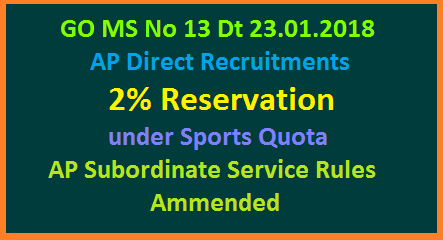 In the reference 4th read above an amendment was made to the said guidelines for providing 2% reservations to meritorious sports persons horizontally in direct recruitment in the existing 100 roster points as per Rule-22(2)(e) of the Andhra Pradesh State and Subordinate Service Rules, 1996, 48thand 98th points meant for Open Competition shall be earmarked to reservation under Sports quota in Direct recruitment. Further, in the event of non availability of eligible sports persons, the points reserved for them should be deemed to be allotted to open competition in the same recruitment. In exercise of the powers conferred by the proviso to Article 309 of the Constitution of India and of all other powers hereunto enabling, the Governor of Andhra Pradesh, hereby makes the following amendments to the Andhra Pradesh State and Subordinate Service Rules, 1996, issued in G.O.Ms.No.436, General Administration (Services-D) Department, dated the 15th October, 1996 as subsequently amended from time to time.